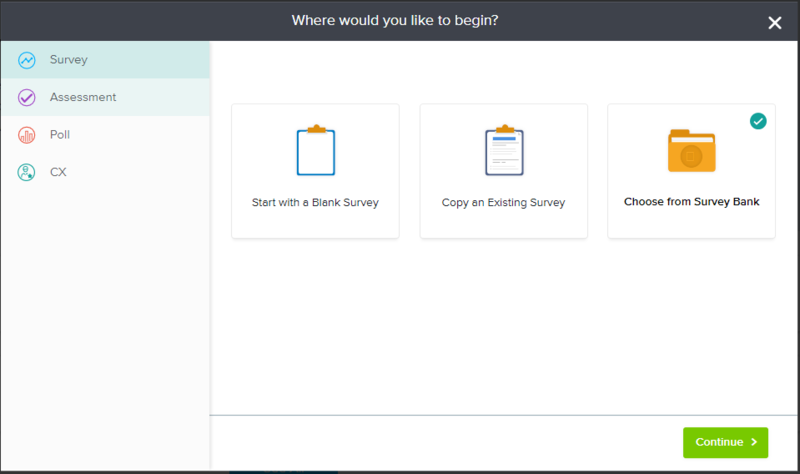 SoGoSurvey provides beautiful ready-to-use survey examples such as HR Surveys, Customer Surveys, Event Surveys, K-12 Surveys, Higher Education Surveys, Healthcare Surveys, and Government Surveys. Feel free to use these as a starting point for your own surveys. When you start from the Survey Bank, you’re already starting with a survey, so you’re off to an excellent head start! Log in to your account and (a) click on the ‘Create Survey’ button on the Home tab OR (b) navigate to the Design tab and click on the ‘Create New’ button. Creating a survey from the Home tab assigns the survey to the Main folder of your account. If you wish to create the survey under a specific folder, please navigate to the Design tab and create the survey under the designated folder. A pop-up will appear, listing all survey categories on the left-hand side of the screen. Each category includes a collection of surveys, which can be previewed before selection. Each survey identifies its the number of pages and the total number of questions. Once you have selected a template, click on Continue. Survey Title: Assign a unique name to each survey to differentiate it from other surveys. Survey Primary Language: This is the language in which your survey will be created. The primary language cannot be changed after questions are added to the survey. Click on Start Survey to build your first survey from the Survey Bank. This template can now be modified as needed to meet your requirements.